The Hawaiian Islands Land Trust continued to protect the lands that sustain us here in Hawaii in 2017 with the acquisition of a conservation easement on 150-acres of Kealakekua farm lands on the Honolulu Coffee Company farm and an additional conservation easement on 10-acres of native ohia forest and native bird habitat in the Kona cloud forest of Kaloko. With these additions to HILT's portfolio of protected lands across Hawaii, the organization has protected over 18,000 acres of Hawaii's special landscapes and their precious natural resources. HILT staff and volunteers are engaged in the management planning process for Honolua Bay/Lipoa Point with the State Department of Land and Natural Resources, Planning Consultants Hawaii, and community organizations and stakeholders including the Save Honolua Coalition. HILT staff and dedicated volunteers also continued ecological restoration work at each of the land trusts' five public preserves. At HILT's Nuu Refuge in Kaupo, Maui, students and volunteers helped to remove invasive plants from over 1,000 linear feet of the Nuu pond. Bird counts this year indicate that the native waterbirds are doing well at this important wetland providing a connecting point between Maui and Hawaii Island. Thanks to the many dedicated volunteers at the Waihe'e Coastal Dunes and Wetland Refuge, over 550 native plants were put in the ground this past year and many of the native species are thriving including the ko'oloa'ula. Over 2-tons of trees and shrubs were cleared from the Maunawila cultural preserve, and community leaders began a kilo program to discover and map the celestial alignments at the heiau. The Kia'i Kahili volunteers continued to conduct beach clean-ups at the beautiful Kahili Beach in Kilauea, Kaua'i. Collectively, over 2,700 volunteers came out to help restore our public preserves and contributed over 6,600 hours to help malama these precious landscapes. Mahalo nui loa to all of HILT's incredible volunteers! HILT's popular Talk Story on the Land series of educational hikes sharing about the natural and cultural history, and resources of our protected areas continued to engage residents and visitors on each island. The land trust was able to lead 65 hikes and share the importance of land conservation with 895 participants promoting the ethic of malama aina. HILT Board Member McD Philpotts shares about conservation efforts with landowners at Palehua Ranch, Honouliuli, O'ahu. HILT was also able to partner with the West Oahu Soil and Water Conservation District, the Division of Forestry and Wildlife and other partners to provide two landowner outreach events to Hawaii landowners interested in learning about the opportunities and benefits of voluntary land conservation programs in Hawai'i. HILT had the privilege of honoring Sam and Mary Cooke and the Manoa Heritage Center for the 2017 Kahu o Ka Aina Award at the Malama Aina Kakou event at Lanikuhonua, Oahu. Over 250 land conservation supporters came out to help celebrate the protection and perpetuation of Hawaii's unique natural and cultural heritage. We were extremely fortunate to have Celebrity Guest Chef Andrew Le from Pig and the Lady and Executive Chef Vince McCarthy of Merriman's Waimea provide an incredible evening of cuisine to celebrate at the 2017 Hawaii Island Paina in Waimea. The HILT "Ohana on Kaua'i had a blast this year at the SOLD OUT Kaua'i Island Pa'ina with Celebrity Guest Chef Mark Noguchi from the Pili Group and Executive Chef Mark Arriola at Merriman's Fish House in Poipu, Kaua'i. The 16th annual Buy Back the Beach at the Old Lahaina Luau was another incredible event with 348 attendees helping to honor US Senator Brian Schatz as the 2017 Champion of the Land. We had an awesome gathering at the annual picnic at Waihe'e and were pleased to honor two of HILT's most loyal and dedicated volunteers, Tommy Morris and Tom Huber. HILT was honored to receive a Preservation Commendation award from the Historic Hawaii Foundation at the 2017 Preservation Honor Awards. It was also a pleasure to receive the Non-profit Sector Award from the Advocates for Public Interest Law at the 2017 APIL Gala event. Mahalo nui to everyone who helped make 2017 a great year for land conservation in Hawai'i! Show your love for Hawai‘i's precious places. Join us on Saturday, January 26th for a night under the stars with mistresses of ceremony Joni DeMello and Liz Morales of Ahumanu as they guide us through a celebration of Hawaiian food, music, and dance, including a private concert by slack-key sensation, Makana. All in benefit of saving land across Hawai‘i Nei. Download a PDF of the invite here. Old Lahaina Luau is hosting this event for the twelfth year in a row—now that's LOVE! 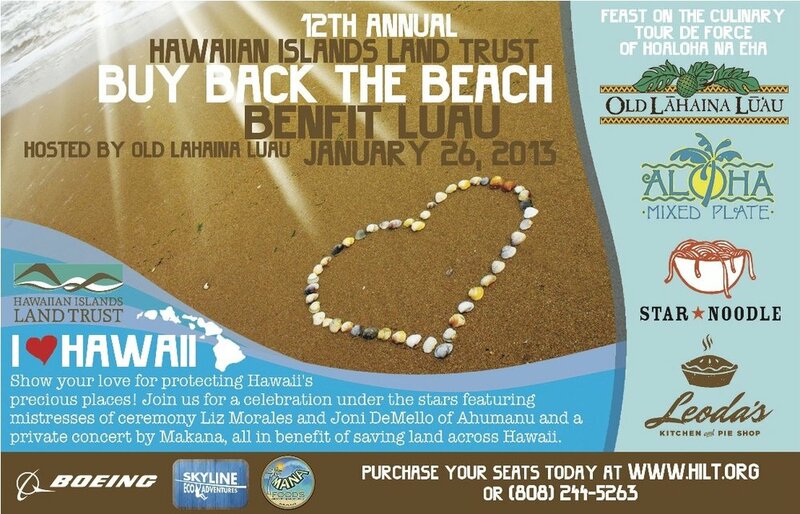 Buy Back the Beach will feature culinary highlights from the luau, plus their family of restaurants: Star Noodle, Aloha Mixed Plate, and Leoda's Kitchen & Pie Shop. Menu tastings are guided by corporate (soon-to-be-celebrity!) chef Sheldon Simeon who is being featured on the current season of Top Chef on Bravo! Bid on custom experiences you won't find anywhere else in the "Adventures for the Aina" Live Auction. Reserve your seats today, this event sells-out early. 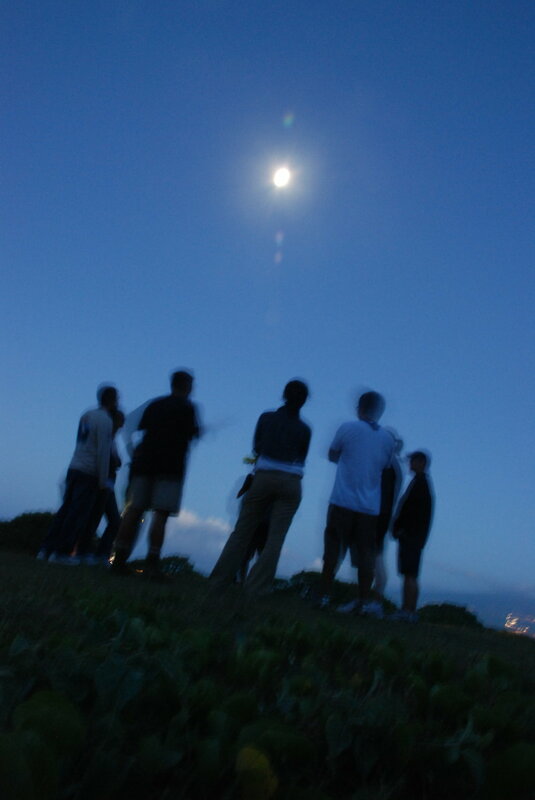 Waihe‘e by Moonlight: Guided Hike & Dinner, up to 12 people An unforgettable way to celebrate a special birthday or the simple beauty of friendship, your private Waihe‘e Refuge experience includes watching the moonrise, exploration by guided night hike, and a catered dinner. Along the easy 2-mile path, MCLT’s project manager Scott Fisher discusses the ancient Hawaiian fishing village of Kapoho while sharing history, lore, and chicken-skin stories. Return to a fun spread of gourmet campfire fare.